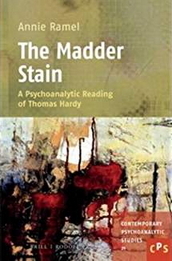 The “madder stain” imprinted on Tess d’Urberville’s arm is part of a motif which runs through Hardy’s fiction. Similar to Barthes’s punctum shooting out of the studium, the stain is a place where the Real erupts, a blind spot that eludes interpretation. In the diegesis of the tragic novels, it is a surplus object whose intrusion disrupts reality and spells disaster. This book attempts to approach that unknowable kernel of jouissance by using Lacan’s concepts of object-gaze and object-voice—sometimes revisited by Žižek. The stain has a vocal quality: it is silence audible. In a world where sound cannot reverberate for lack of a structural void, voice is by necessity muted, stuck in the throat. Hence the peculiar quality of Tess’s voice, a silent feminine cry that has retained something of the lost vocal object. The sound of silence is what Hardy’s poetic prose allows us to hear.